We have 23 learners on our records this year and an average class is between 6-9 people. All our learners are female[…]. 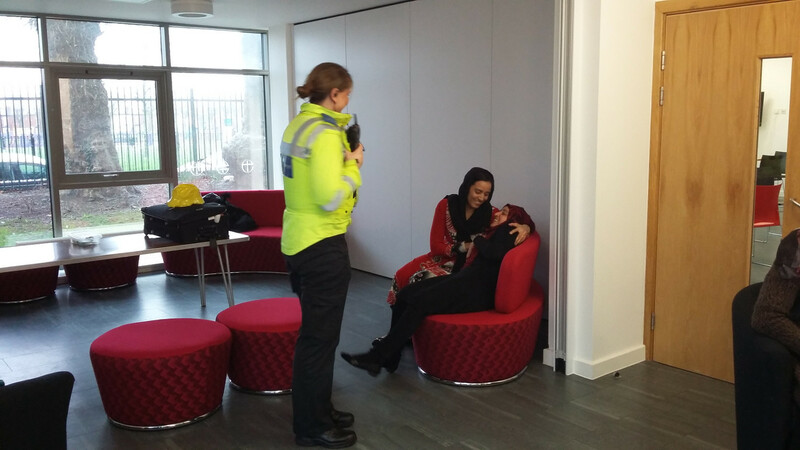 We are finding the majority of our learners are attending the course in order to build up their confidence when out in the community, although two ladies were attending to work towards their citizenship test. 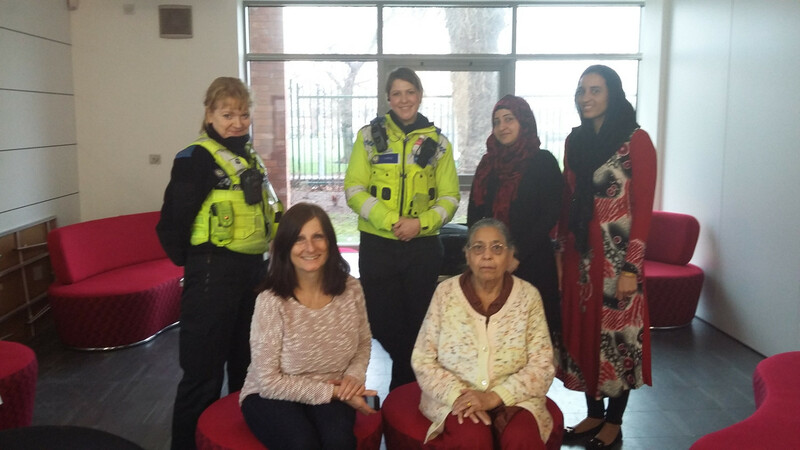 Because of the range of cultural backgrounds within the group – Pakistani, Chinese, Yemeni, and Bangladeshi – what is apparent is how this course is a great platform for building community cohesion; and we are seeing the learners come along to other events we provide to help build community. Last Monday we worked Contacting the Emergency Services from the Term 2 booklet. 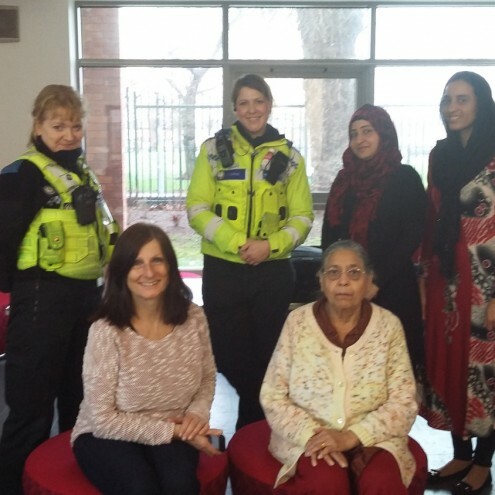 We invited the local police to this session since it would help introduce the ladies to the police and help build reassurance if they ever needed to make contact; something which they otherwise may have found intimidating. 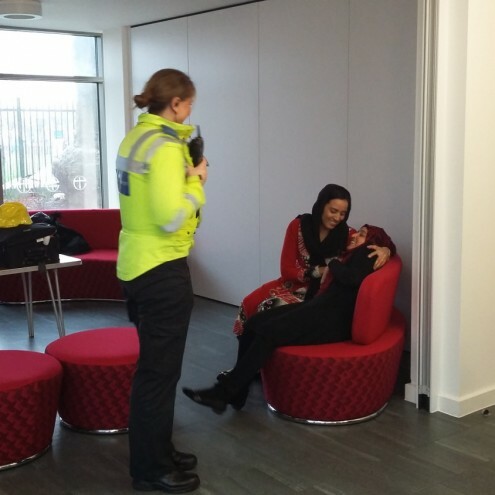 Not only did the police come and provide safety advice and awareness but they also participated in some of the role play. It was really good fun and at the end of the session all the ladies agreed that they felt more confident in the event of an emergency and keeping themselves safe. During the summer we will hold an award ceremony for those who have participated which I will keep you informed as we would be delighted for you to attend. The Harold Road Centre had previously been running an accredited English class until funding was cut, and decided to continue with informal English classes to complement their Literacy class. They felt Creative English offered the holistic experience they desired, and many of their learners now continue their experience through a newly-formed conversation club. Pavana is a 45-year-old Indian lady who has spent many years living in the north of Italy. English is not her second language – it’s roughly her fourth! And she’s only been in the country for about 8 months. This week, she told me that she is much more confident in speaking English ever since she started. She has readily joined in and she really enjoys the class. She said she had used what she has learned at her children’s school, the optician, the doctor and the dentist. She was also able to tell me she had begun volunteering in the crèche at her local primary school. The Community Resources Hub in Dagenham works to build community cohesion in its local area. It is primarily staffed by local volunteers who are passionate about sharing in the development of their community. Sally Dixon, the Hub’s facilitator, told us about one of their learners. Elsa has been coming to class for 8 months now. She has excellent English – which she taught herself by watching TV – but her confidence is low. Last week, I asked her if she would consider volunteering for me at the class as I don’t want to lose her but the class is a bit basic because I have so many beginners. I could not have predicted the level of enthusiasm with which she greeted the invitation! It made me realise how powerful it is to show someone that you have faith in them. Souri stands out due to her commitment, energy and willingness to go above and beyond and use the Creative English methodology to meet the wider needs of the participants she works with. The first training that she attended as part of her involvement in the programme focused on using drama for language learning. Souri had an extremely open, positive attitude that meant that not only did she get the most out of the training, but that she inspired other trainees to push themselves and see the potential of using drama in their communities. Souri has facilitated sessions that have enabled women to access healthcare without relying on a translator or family member for the first time. The learners she has worked with have increased in confidence and would find it difficult to access English language provision without the sessions she provides.